Another big update from me! I have two new paintings to show you! Tinker Bell at Skull Rock here and Frost Dragonling here! The LAST #5/5 Limited Edition Canvas of "Luna Eclipse" is up for auction here. A very special piece I painted LIVE as a demonstration painting at Disneyland's WonderGround Gallery! It was a lot of fun to paint in front of such a large audience, and I'm very happy with how she turned out. 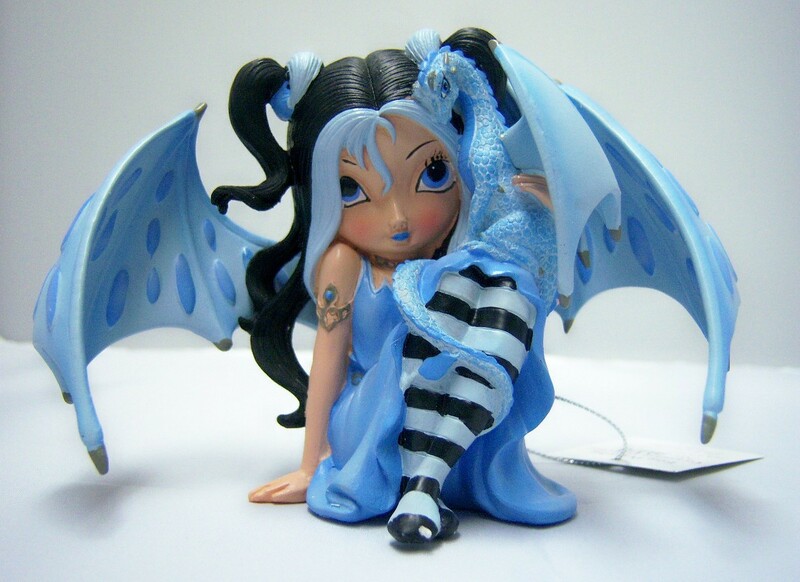 Frost Dragonling is of course part of my Dragonling series (be sure to check out the matching figurine available from the Hamilton Collection - part of my Dragonling Companions collection), featuring a beautiful dragon fairy and her baby dragon protector. A nice frosty scene - you can see the Northern Lights / Aurora Borealis in the sky as the sun sets in the distance, and there are hints of grass poking up through the snow and ice. Love the colours in this one! Frost Dragonling is also a figurine! Click here to see her & her sisters, shipping available worldwide! 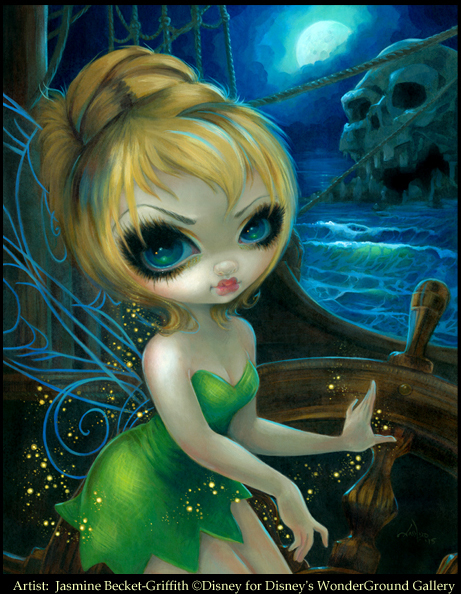 "Tinker Bell at Skull Rock"
Prints, canvases and merchandise available from Disney worldwide! Details below. One of the pieces I painted for Disney that debuted during my "Take Over" at the WonderGround Gallery in the Downtown Disney® District at the Disneyland® Resort in Anaheim, CA. Licensed & contracted by Disney, ©Disney, this is my original acrylic painting featuring Disney’s Tinker Bell from the animated film “Peter Pan”. Tinker Bell of course is shown here surrounded by magical pixie dust, accompanying the pirate ship to the mysterious Skull Rock ! Prints, merchandise and Limited Edition Canvases are available exclusively through Disney. If you are in California, you can get this image in various formats at Disneyland's WonderGround Gallery. In Florida, she's available (or will be shortly) at the WonderGround Gallery there located inside Disney's Marketplace Co-Op in their Downtown Disney / Disney Springs, as well as various other locations at Walt Disney World. I will be coming to Disney's Marketplace Co-Op in Florida on August 8th and would be happy to sign your Tinker Bell there! Don’t live in California or Florida? Luckily, Disneyland’s WonderGround Gallery is very happy to ship worldwide and takes orders via email at:merchandise.guest.services@disneyparks.com or by telephone at: 877-560-6477. 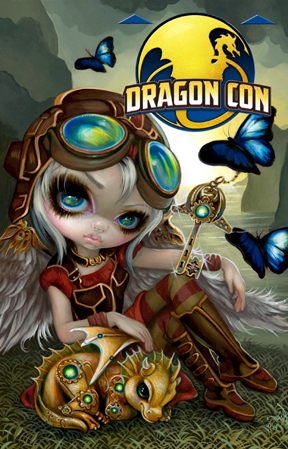 Just let them know you are interested in Jasmine Becket-Griffith’s artwork from WonderGround Gallery and they would be happy to let you know what is currently available. Click here to see Tinker Bell and Jasmine's other Disney artwork currently available from various sellers on eBay! 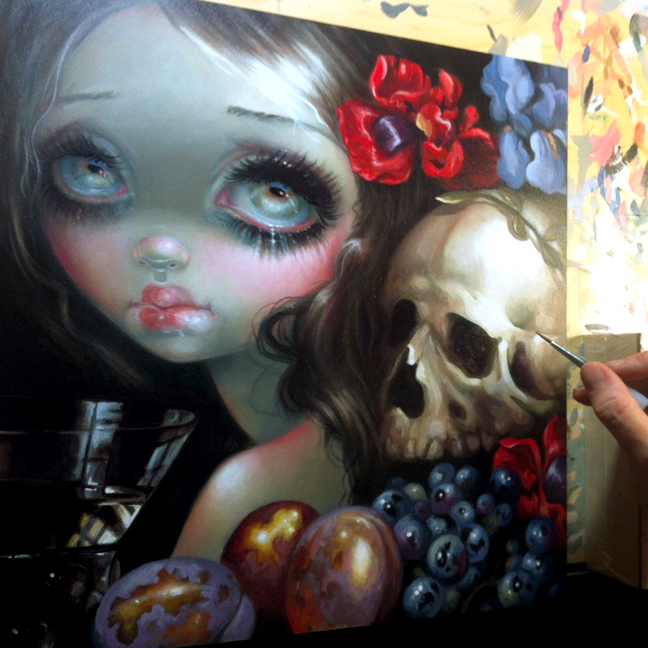 My "Stilleven XI: Vanitas" painting debuts Saturday night! If you're in Los Angeles this weekend, be sure to check out the annual group show at Corey Helford Gallery! Their "Art Collectors Starter Kit" show (consisting of 12x12" square paintings by many fabulous artists) opens this Saturday night at their gallery in Culver City. My painting (shown in progress above) "Stilleven XI: Vanitas" will debut there, priced at $3500 for the original 12x12 acrylic piece. Prints for the painting will pop up on Strangeling.com next week, keep an eye out! Details about the art show are here. Two new designs, with many others available! Available for shipping worldwide - click here - we've just added these two new ones (Pink Lightning and Three Little Birds) - there many other designs are available too! I have a couple of these blankets myself and they are SUPER soft (my cats love curling up on them too, lol). 100% Plush Polyester Fabric, Measures 57” W x 36” H, Machine washable, Printed with HDP technology in USA, $59 each. Yes, they ship anywhere in the world! I'm just the artist who painted the original paintings, if you have questions about ordering, shipping, pricing, payments, materials, etc. please contact People's Choice Apparel directly at the link above! Collectors - get your PDF preview emailed today!